First of all: WE KNOW. Everything has changed; things will be different and it's going to take a lot of work for @Lincoln to get things back to the way you're used to. Please don't use this discussion to COMPLAIN. Please DO use this discussion to post things that you've noticed, bugs, or suggestions. Poor Lincoln is up to his eyeballs with things to fix and finish, so please, above all else: Be kind. If anyone wants their bookmarks list cleared / reset let me know. It grabbed all your "subscribed threads" from vBulletin. @NiGHTS You probably need to clear your browser cache. HOLY CRAP THIS IS SWEET! My avatar is back. It took one single click to do it. So damn good. First bug I've noticed - odd timestamp errors. 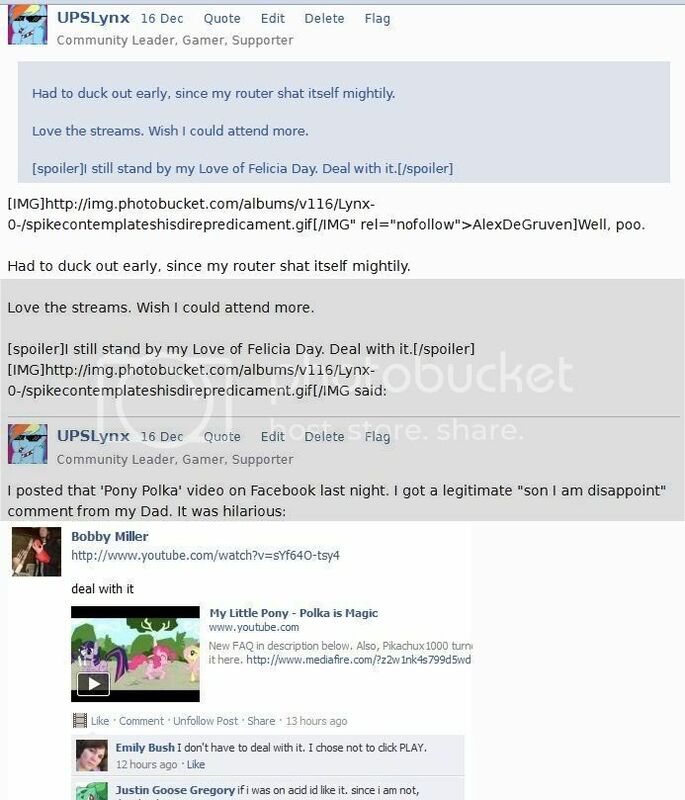 So in the "First" thread, Linc posted first, then Brian, then Piggeh, then Dan, then Canti, and finally me. Yet post times are all wonky, and it ended up re-ordering the posts incorrectly based on these false times. 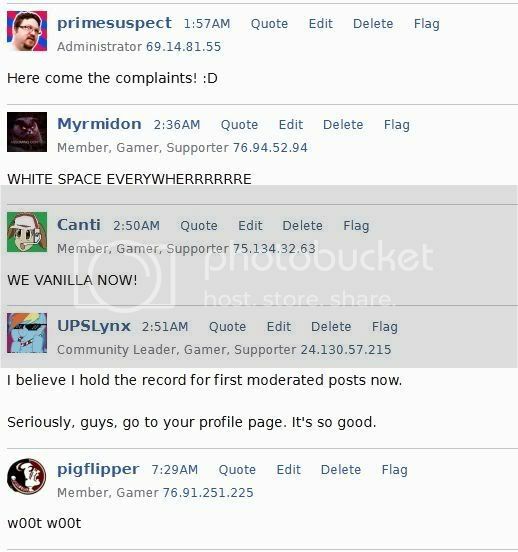 @UPSLynx Yeah, piggeh's comment didn't take timezone into account. Pretty sure this is a bug in Vanilla. We recently changed Vanilla to use UTC time in the database and I've gotten other reports like this. I'll be investigating tomorrow. The original text itself works just fine, but in my post where I quoted it, the tags show up and the images do not display. Spoiler tags, however, don't seem to work at all. As you can see in the display image that the bottom of that pic, image embedding is just fine outside of quoted circumstances. Spoilers are broken, yes. That's gonna be low priority. The broken BBCode Quotes are a major PITA and will be dealt with soon. Somebody warn @CB. Entire site is spoiler until further notice. I'll leave you alone now. Nothing major to report outside of those. This is looking fantastic, dude. It's 6am. I've had half a glass of champagne. What am I doing? Your profile/preferences page seems to have trouble with the popup "delete" buttons. Sometimes they appear, but you really gotta futz around with them to get them to work (and sometimes they don't appear at all). Other than that...well, I do suppose I'm going to love and tolerate the crap out of this new stuff. Someone's already brought up the broken tabs issue, so that's more of my reporting out of the way. EDIT: Actually, there's another one. Not sure if this is an oversight, or if I'm not finding it, but I can't find the button to allow you to edit the top post of a topic. Minor note: the terms flag and bookmark are confusing. You flag a thread, by clicking the star, and that makes it a bookmark? But you flag a post to report it to the mods? Perhaps the word 'flag' over the bookmark star should say 'bookmark' instead. Also there doesn't seem to be a way to flag the OP for mods to see, unless I'm just missing it. Edit: I see now: 'Flag' up by the OP is a separate button, not a label for the star. So, um... still confusing at first glance apparently? We could use an updated mod guide for what the new terms mean. I'm afraid to click on these or the thread options dropdown since I'm not sure which are mod tools and I might nuke a thread. There is a feature in our profiles 'Edit thumbnail'. I'm not sure if we're even using it, but whatever it's for, it doesn't successfully cave changes. Edit: Okay... I guess I was confused again. the thumbnail is my in-thread avatar? but when I click to change it, it resets every time. Rather than showing what it is currently, one must rechose the thumbnail from scratch each time. Not sure if that is expected behavior. and if that determines our avatar, where is our full avatar used? Just on our profile page? Please clear my bookmarked list, I told vBulletin no bookmarks and apparently it just made notes and did not display them. This is gonna take som getting used to, but we'll persevere. Looks good though! I like that the OP is at the top of every page of a discussion, but I think it needs greater visual clues to show that it's not part of the linear discussion of that particular page. Is it possible to just flush the new messages counter for all my bookmarked threads? It basically says I haven't read any of them. Change is bad. I hate change. The only things that should be changed are diapers. Therefore, I am leaving Icrontic forever. @NiGHTS MUST READ ALL THE POSTS! I just want to be say it's about the time! Ding dong vbulletin is dead! :-) also, I love that you finally have a mobile friendly layout. Now how do I turn email notification off? My phone has been blowing up all morning. "for @Lincoln to get things back to the way you're used to."